On Nov. 24, 1973, a U.S. Navy Douglas C-47 ran out of fuel and crash landed on a black sandy beach in Sólheimasandur in Southern Iceland. The crew survived the landing, but the plane wasn't so lucky. Its carcass has sat on that beach for 40 years. 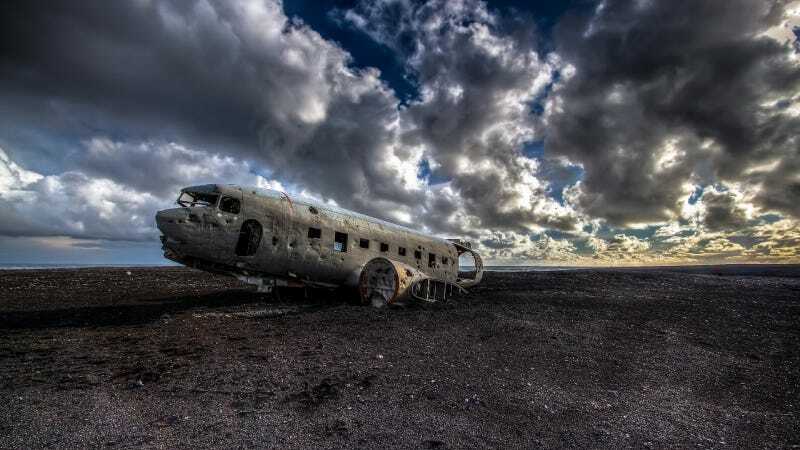 While it's only about 2 hours and 15 minutes from Iceland's capital city of Reykjavik, the plane crash site is an eerie sight that feels like it could come from a post-apocalyptic movie. Today, the plane's hollowed-out fuselage is a popular destination for amateur explorers, tourists, and of course, photographers. Photographer Ian Grant writes on his blog that the military attempted to recover the plane with a helicopter at some point, but they abandoned that plan following a fatal crash and decided to leave the plane where it was. Grant has a number of awesome photos of the DC-3 crash on his site, as do a multitude of other folks who have ventured out there over the years. The website Amazing Places on Earth says the GPS coordinates of the crash site are 63.459523,-19.364618. If you ever go check it out, bring a camera.